A visit to Hawaii is one you will long remember, for here is truly the Paradise of the Pacific. Your memorable visit will of course include all of the various tourist attractions, and Mahalo Records has sought to bring you some of the musts on every tourist's list. Your first stop should be the Shell Bar at the (site of TV's Hawaiian Eye) to hear the newest piano sensation of the nation, Rene Paulo as he plays "Hiilawe." Next stop is the world famous Royal Hawaiian Hotel where Charles Kaipo is featured in the Monarch Room. Charles lends his unusual falsetto to the favorite "(Love Song of) Kalua." An evening of cocktails is best enjoyed at our next stop, the Captain's Galley where DeWayne Fulton holds forth with his harp. Here we hear DeWayne play "Beautiful Kahana." Right across the street we find the International Market Place, and we look in on a TV party given by one of Hawaii's favorite comedians, Lucky Luck, going thru some nonsensical pidgin English comedy based on the names of places, and streets. While still at the Market Place we see the famous Polynesian outdoor show, and hear Lanikila's Polynesians as they swing some hips to "Na Waka." For some extra spice we have thrown in the spirited Like playing of Eddie Bush as he plays "Blue Hawaii." Of course you will have to spend some time sitting on the famed Waikiki Beach listening to the beach boys sing their favorites. Here we hear Charles Kaipo sing everyone's favorite "Little Brown Gal." As is the habit of most tourists, you will want to spend some time just relaxing on the Lanai of the hotel watching the sun set and listen to the Diamond Head Beach Boys play "Lovely Hula Hands. One of the tourist musts is of course the Hukilau, a kind of community fishing effort with nets. Here we hear Sol Kamehele singing the "Hukilau." Next we go to a typical Luau, this one takes place at the Hawaiian Village, and knowing your trip would not be complete without this song, we have had Danny Kaleikini and Lani sing you the "Hawaiian Wedding Song." Once a week Kodak puts on a show for you to photograph all of Hawaiiana, and at this show you will be bound to hear "Keep Your Eyes on the Hands." As all good things must come to an end, we would like to give you a pleasant ending with the chorus singing "Aloha Oe. 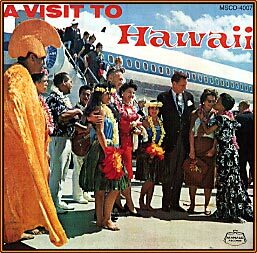 Whether you be Kamaaina (old timer) or Malihini (newcomer) this song is sure to bring a swell to the throat, and a slight tear to the eye, but don't be sad, everyone returns toHawaii, and if you are unable to return, we hope that this compact disc will bring you fond memories of A Visit to Hawaii.